Numerous studies have demonstrated that plasma total homocysteine is a strong, graded, and independent risk factor for coronary heart disease and stroke. Elevated Total Homocysteine Levels in acute Ischaemic Stroke has been associated with long term mortality in some studies. There are several genetic disorders which predispose to vascular complications. Homocystinuria was first discovered in the early 1960s. It was found that some children born with the genetic disorder called homocystinuria, which causes the homocysteine levels to be very high, sometimes died at a very young age with advanced atherosclerosis. Homocysteine is a naturally occurring sulfur-containing amino acid. It is a key intermediate of one-carbon metabolism and may serve as a surrogate marker of one-carbon metabolism status. It is involved in methionine synthesis and connects several B vitamins, including vitamins B-2, B-6, and B-12, folate. 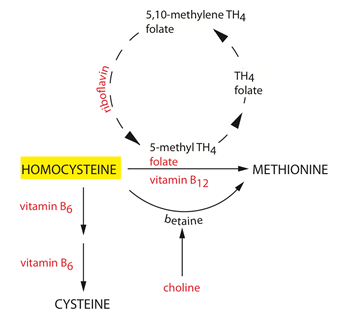 Compared with individual nutrients that partially mediate one-carbon metabolism, homocysteine may reflect the global network of one-carbon metabolism while simultaneously representing the optimum balance of these multiple nutrients. Homocysteine concentrations have been associated with several disease outcomes, including cancer, cardiovascular disease, neurodegenerative disease, and pregnancy complications. Most labs report normal ranges of homocysteine as about 4-15 micromoles/L but this can be > 100 micromoles/L in disease. It is felt that eating cereals that are fortified with folic acid, and to a lesser extent vitamins B6 and B12, can lower blood homocysteine levels but it has not been shown that there is a commensurate reduction in vascular risk. Homocysteine levels are not routinely measured in people with stroke or heart disease.